Brokers brushed aside a robust first half result for Aurizon, instead looking at the issues which cloud the outlook beyond FY17. Bulks and freight haulage business Aurizon ((AZJ)) may have beat many forecasts in its first half result but numerous favourable and non-sustainable items took the gloss off the beat. While there have been improvements across the key commodity markets of coal and iron ore, the company has not yet witnessed a significant impact on volume. The main benefit of the improved commodity outlook, in Deutsche Bank's view, is that commodity customers are all operating at positive cash margins and this should alleviate some of the pressure. The coal business currently has an average contract life of 10.1 years and new-form contracts account for 96% of volumes. The network division benefited from higher-than-expected recoveries and around $33m in benefits will not be repeated into the next half. Deutsche Bank forecasts the Aurizon network to deliver operational earnings (EBIT) for FY17 of around $550m but, given the $132m in benefits flowing in that year, FY18 will likely be lower and the broker's current forecast is $505.9m. At this stage there appears to be some earnings headwinds into FY18 and Deutsche Bank downgrades its recommendation to Hold from Buy, given the shares are now trading at a premium to the broker's $5.10 share price target. The company remains committed to its transformation program, targeting $380m in savings by FY18. The company has also indicated all investment proposals will be assessed against share buy-backs as a use of capital. Aurizon's network division submitted its draft access undertaking for the regulatory period commencing July 1, 2017, in November (UT5). Further dialogue with the Queensland Competition Authority is expected and a draft response from the regulator is due in the next six months. While the coal division is on track to haul between 200-212m tonnes, the bulk freight/intermodal division remains challenged, brokers believe. The intermodal segment is currently being assessed and a decision on its future structure is expected mid-year. Macquarie expects the intermodal business, which is losing money, will be sold and this provides an immediate area of leverage in pre-tax profit of around 2%. Bulk freight divisions are more significant, with $400-450m in assets employed. Successful re-pricing and transformation of these should add around $60-70m to pre-tax profit. Any clarity around a change to fundamental strategy is not expected before mid-year, although the company will act ahead of this and execute on reducing capital expenditure and re-pricing bulk contracts. The broker believes such activity will improve investor confidence around the structural changes. Nevertheless, the fundamental issue remains that the coal boom is over and system volume growth is likely to be only modest going forward. Macquarie downgrades to Neutral from Outperform, noting the new management team is making changes which are welcome but the fundamentals are challenging given limited revenue growth. Moreover, the current share price more than captures a new management premium and expectations of improvement. The second phase of the company's freight review, following the first stage of write-downs announced in January, will be unveiled mid-year with decisions expected around intermodal and refining of the bulk business asset values. Macquarie expects further asset write-downs and potentially onerous contract provisions. UBS downgrades FY18 estimates by -3-4% as revenue one-offs booked in FY17 make for a challenge in following year. The broker acknowledges there is possible upside with the execution of an early exit, or turnaround, in the loss-making freight divisions. Nonetheless, the UT5 regulatory review is unlikely to be completed in time and the broker takes a cautious view on the company's application. Cash flow is the company's strong point, brokers contend, and long-run capital expenditure guidance continues to decline. UBS forecasts gearing to remain at around 2.0-2.5 times EBITDA and in the absence of asset sales this makes capital management over the near term challenging. Based on the dividend pay-our ratio and free cash flow yield, UBS believes the stock is fully valued at present. Morgan Stanley also envisages little room for positive revisions to consensus earnings expectations, particularly as UT5 is yet to be fully incorporated into estimates. Nevertheless, with robust cash being generated and further declines in capital expenditure likely, additional capital management options are likely to be considered in time. In line with the existing conservative gearing policy, the broker suspects at least $400m could be returned to shareholders by FY20. Until the final UT5 outcome is known, Morgan Stanley expects positive news around capital management will support both valuation and sentiment. While constructive on the FY17 outlook, beyond that the broker is cautious as it remains unclear whether the recovery in coal prices will translate into higher above-rail volumes. Ord Minnett was surprised by the positive reaction in the share price as it considers there were enough one-off items to cast a cloud over the performance. The broker highlights several risks including a possible outcome for UT5 that is 14% below the company's proposal. Also, pricing pressure evident in iron ore continues to make Ord Minnett wonder about the long-term profitability of the company's two relatively high-cost customers. Finally, the broker worries that the above-rail coal volumes and margins may suffer from increasing competition in the years to come. FNArena's database shows six Hold ratings and two Sell. The consensus target is $4.75, suggesting 7.9% downside to the last share price. Targets range from $4.20 (Ord Minnett) to $5.10 (Deutsche Bank). The dividend yield on FY17 and FY18 estimates is 5.1% and 5.2% respectively. Find out why FNArena subscribers like the service so much: "Your Feedback (Thank You)" - Warning this story contains unashamedly positive feedback on the service provided. A glance through the latest expert views and predictions about commodities. China and coal; ASX gold sector; outlook for energy sector; iron ore prices. The question of whether the Chinese government will re-impose the 276 work-days rule for Chinese coal mines is an important one for coking coal prices, Credit Suisse attests. Prime hard coking coal has fallen to around US$170/t, around US$35/t below Tangshan in price parity terms. Stronger steel production, as China enters its spring construction season, and the work-days rule being imposed at the end of March, are two factors that may help the price. The thermal coal price is not yet in the government's target range, having hovered close to RMB600/t since the start of the year. For China to impose the 276 work days rule, the broker expects thermal coal would need to enter its targeted price range which is believed to be RMB500-570/t FOB. Thermal coal is not yet abundant in China, with Credit Suisse noting stocks at the port in Guangzhou were depleted to 900,000 tonnes in the first week of February, the lowest level in the broker's eight years of recording the data. The ASX gold sector has reported strong production in the December quarter, leading the way on cost improvements with 75% of miners, overall, beating Deutsche Bank's forecasts. The broker notes the sector has increased 12% in the last month, which compares with the US dollar gold price being up 4% and the Australian gold price being flat. The best performing equities were St Barbara ((SBM)), Newcrest Mining ((NCM)) and Regis Resources ((RRL)). The broker expects the sector to be focused on organic growth and exploration over the next three months. Deutsche Bank updates its models following the December quarter production reports, downgrading Evolution Mining ((EVN)) and OceanaGold ((OGC)) to Hold and Regis Resources to Sell on valuation. Deutsche Bank has become more constructive for the near-term outlook in Australian energy coverage, supported in its view by a much firmer and rising oil price. In 2017 the broker expects demand to outstrip supply on forecast, which underpins a forecast for US$55/bbl Brent oil for 2017, as excess inventory is a gradually depleted. The degree of adherence to OPEC's production cuts remains the key swing factor. Longer term, new production is likely to be necessary from higher-cost regions and a price signal will be required for such projects to proceed. While spot LNG markets have recovered in recent months from stronger demand, the broker expects a medium-term oversupply as the build up in new LNG capacity accelerates. The broker's top pick in the sector remain Oil Search ((OSH)) because of its high quality assets. Santos ((STO)) also features in the broker's preferred exposure, with its exposure to PNG LNG and strong leverage to a rising oil price. The broker also likes Caltex ((CTX)), which it believes is currently pricing in unrealistically low expectations. Morgan Stanley believes there is more growth than investors allow for in Woodside Petroleum ((WPL)). The growth plans that are underway are likely to exceed expectations over time. The broker notes the company's low-cost and low-capex LNG assets have enabled it to re-position its portfolio over the past 12 months. These projects should drive production and cash flows from the beginning of the next decade. Production is set to grow to 96.1mmboe in 2018 and 100mmboe by 2019. This should lead to higher operational earnings (EBITDA). The projects become key drivers of value over the next 12 months, in the broker's view, as the market is applying little value to them. Capital expenditure is expected to be stable, meaning free cash generation will improve. There is also spare debt capacity of over US$1bn in 2018, providing potential for capital management and this should become a focal point for investors in the latter half of this year. Moreover, the broker believes the company's M&A strategy over 2016 was right and expects Woodside will focus on oil opportunities outside of Australia that are either producing or have near-term development potential. Morgan Stanley upgrades its valuation for Senegal, Scarborough, Myanmar and North West Shelf backfill. The broker has an Overweight rating and $40.00 target. Ord Minnett observes the drivers of the recent iron ore price rally to US$80/t appear to be a combination of Chinese demand, solid consumption in the rest of the world as China reduces steel exports, and relatively flat supply. The broker expects tight conditions to persist through the first half of FY17 but the price will eventually provide incentives for additional supply to come on line, and this could remove some of the current pricing tension. Ord Minnett raises its 2017 forecast for iron ore to US$73/t but still expects a downward trend towards the year-end as supply grows. Overall, the broker expects major miners to add 71mt in 2017, with global demand growth of 43mt expected. While viewing the market as broadly balanced, the broker acknowledges a risk in the growth in non-traditional supply, with the incentive of higher prices. Macquarie observes iron ore is the only steel-making ingredient for which prices are still holding up, as coking coal, manganese and steel scrap prices have all weakened from recent peaks. The broker expects prices will ease for iron ore now that the Chinese new year holidays are over, as supply is clearly abundant. Steel mills are expected to pressure iron ore sellers, despite the traditional post Chinese New Year pick up in steel output and demand. Full year Chinese trade data shows total iron ore imports rose 7.5% in January year on year, while the broker estimates iron ore consumption rose by less than 1% last year. Indian iron ore exports also show the biggest response to higher prices, Macquarie observes, aided by the removal of low-grade export taxes and export bans last year. While the Indian government has maintained export taxes of 30% on fines above a 58% iron grade in the February budget, the broker envisages India could still export 30m tonnes or more of iron ore at current prices. A glance through the latest expert views and predictions about commodities. Silver use in PV cells; zinc markets; China's coal policies; dividend outlook for miners. Citi suspects demand for silver in the photovoltaic (PV) cells market may improve in 2018, based on optimistic estimates of global cell capacity. Demand for silver in solar cells is in a state of flux and likely to decline over the medium term, as 2017 becomes a year of de-stocking of capacity and global demand catches up with supply. Demand for silver emanating from solar cells comprised 7% of total silver demand in 2016, according to industry estimates. It is believed, based on these estimates, that the volume of silver used within PV cells is declining around -5% every year, because of continued efforts to reduce costs. In the event that silver prices rise rapidly, the broker believes companies may adopt more stringent cost-cutting programs, or invest in non-precious metal components altogether. Alternative technologies are still too expensive to displace existing solar cells but the risks of copper substitution within IBC solar cells could decrease the silver paste market share over the medium term. Meanwhile, PV rooftop tiles may eventually improve end use in residential markets and grow the distributed energy network. The amount of silver used in roof tiles is not yet clearly evident. Much depends on whether the tile is a thin-film solar cell or a monocrystalline silicon. Hence, based on current arrangements, Citi approximates 100-120 mg of silver per tile could be in use. The broker expects both the efficiency and rising adoption rates will increase the penetration of PV cells among US households. In the current market, where the Chinese government has clamped down on feed-in tariffs for solar PV systems, Citi believes only the lowest-cost manufacturers are likely to survive and possibly increase market share. Policy and subsidy changes may begin to slow down production and, while solar growth in China exceeded expectations in 2016, the broker question is whether the rate of growth is sustainable. Chinese trade and smelter production data have confirmed that market tightness is yet to emerge. Nevertheless, zinc prices look robust in the high US$2000/t range, Macquarie asserts. Chinese smelters are now making minor reductions in output and the ex-China market is preparing for a marathon negotiating period for 2017 concentrates. Macquarie believes the wind is favouring sellers at this juncture. The broker agrees continued price strength suggests prices will be above US$3000/t by the end of the year. After that, the trajectory is less certain. Glencore's shuttered mines are likely to return to production at some point while new projects are being accelerated. The price of zinc relative to other materials such as aluminium will begin to destroy demand the longer the price remains high. In 2018 the broker expects continued shortages of metal but also a subsiding of demand growth. Macquarie's current base case rests on a re-start of the Glencore mines in mid 2017. A combination of these changes is likely to dampen prices before more concrete physical market re-balancing arrives in 2019/20 to bring zinc prices back down to earth. China is expected to underpin the global coal market in the near term. If prices continue to slide, Macquarie expect some form of output restrictions will come back, such as the 276 days policy, which was suspended in November until the end of the first quarter. The government recently outlined a thermal coal price target around the annual contract price of RMB535/t. Supply intervention now appears only likely if prices are above RMB600/t or below RMB470/t. The Chinese government's pronouncements may be enough to prevent prices trading outside this range and the broker's confidence in this scenario is one of the main factors underpinning its recent upgrades to coal price forecasts. The broker also contemplates a scenario where China will pull back from its readiness to accept coal imports, as an alternative measure to support domestic coal prices, particularly as the policy goal is to support domestic mining. Macquarie notes Beijing's ability to strongly intervene in domestic supply renders traditional supply and demand analysis for coal largely obsolete. It is possible the government could make further adjustments to import taxes and/or coal quality cut-off levels, in an effort to dissuade imports and provide more assistance to domestic coal mines. This is not Macquarie's base case. Nonetheless, the broker believes it is a risk worth highlighting, as if this was to happen it would clearly provide downside risks to seaborne coal price forecast. The potential for the mining sector to re-rate on structural changes in dividend policies is a key debate, Morgan Stanley observes. Yet, analysis indicates the mining sector is unlikely to re-rate on a shift to dividends, based on pay-out ratios. Analysis of long-term dividend trends suggest there is a modest historical correlation between dividend yield and relative performance, except at extreme levels. The broker warns the market is currently close to such an outlier and, historically, this has driven 2% relative underperformance in the following 12 months. The broker believes dividend signals are not as strong as the debate suggests and the market is currently close to such a level which is not helpful for sector performance. The broker notes a switch from progressive dividends to pay-out ratios reduces the risk of over-investment during periods of high cash flows. On average, Morgan Stanley calculates companies are targeting 50% pay-out ratios. This compares to 42% and 44% for Rio Tinto ((RIO)) and BHP Billiton ((BHP)) respectively. The pay-out ratio dropped to 26% and 32% respectively during the super cycle, as progressive dividend policies encouraged more re-investment in growth relative to dividends. In the pre-super cycle period pay-out ratios reconcile neatly with the new dividend policies, the broker asserts. Considering the outlook for volume growth across commodities Morgan Stanley believes it will be hard to replicate double-digit rates of growth. On a base case estimate the broker's forecasts imply 3% and 2% growth in dividends per share for Rio Tinto and BHP Billiton, respectively, for the 10 year period 2017-27. BlueScope Steel has upgraded earnings estimates for the first half and brokers welcome the work done to improve the outlook and balance sheet. BlueScope Steel ((BSL)) has materially upgraded earnings estimates, with the biggest surprise for brokers emanating from building products, dominated by a stronger performance in the company's US operations, given higher steel prices and margins. India was also stronger. The main drivers of the upgrade, with first half earnings guidance now $600m versus the “at least” $510m proffered at the AGM in November, are higher steel prices and spreads, particularly in Australasia. Stronger iron ore prices are also supporting the iron sands business along with productivity improvements and cost reductions. Management will recognise an impairment charge of around $65m, largely from the restructuring of the China buildings and Indian engineered businesses. Macquarie retains its Outperform recommendation, noting a broad-based improvement which suggests the company's cost reductions are being realised and progressing ahead of plan. While the stock has had a good run, momentum is still considered positive in the near term. Market conditions are supportive, while management actions appear to be delivering to the upside, in the broker's view. The stock continues to trade at a meaningful discount to global peers yet the investment case is not without risk, Macquarie acknowledges. The main issues are the demand and supply dynamics in China, which could reassert pressure on the steel market in the second half. Also, a maturing residential building cycle in Australia could present challenges. The broker notes the strong progress made in re-positioning the balance sheet, with net debt of $530m as of December 30 a little better than expected. Nevertheless, stronger earnings have not generated a correspondingly strong cash flow, in Credit Suisse's view, confirming a suspected increase in working capital to fund higher iron ore, coking coal, scrap, coating metals and steel prices. Credit Suisse acknowledges that further debt reduction offers an opportunity for a more generous dividend while, in light of Chinese cuts to steel capacity and a stronger domestic outlook, surplus Asian steel seeking an export market is declining. Credit Suisse downgrades to Neutral from Outperform on valuation grounds, also flagging the risk that a foreign owner could acquire Arrium's steel making and distribution assets and use this as a conduit to the domestic market. While acknowledging it is difficult to value the stock against recent history, because of the structural change in the cost profile of the steel assets in Australasia, UBS believes there remains inherent value within the franchise. The broker calculates that value exists even if steel maker spreads moderate from current peaks. Moreover, UBS expects US steel maker margins are likely to remain elevated for a longer period because of effective protectionist measures against imports, which may be underscored by the incoming US administration. This means the broker's average US steel spread assumptions in FY17-19 rise to US$320/t from US$260/t, and this is the key driver of upgrades to its EBIT forecasts. Morgan Stanley also envisages building products have the largest area of upside in terms of the company's divisions, particularly in North America because of higher steel prices and margins. City is bullish, believing the company is firmly on track to exceed the key $1bn earnings (EBIT) mark in FY17. The broker considers the stock a story of quality and low financial leverage. Several options exist for BlueScope, including opportunistic acquisitions, capital returns or an increase to the pay-out ratio. The broker lauds the work that has been done to re-shape the steel industry in Australasia and a raft of benefits from extremely challenging, but necessary, decisions which are now aligning to reward shareholders. Ord Minnett raises its rating to Accumulate from Hold, noting most divisions are performing to expectations and capital management is likely to be a positive catalyst as debt rapidly reduces. The broker believes valuation screens as attractive on both a fundamental and relative basis. Trade indicators have been positive, with Chinese net exports falling and BlueScope benefitting from increased trade action and price improvements. While Australian steel remains exposed to a peaking residential cycle improved diversity in earnings should reduce volatility, in the broker's opinion. Deutsche Bank is more conservative, continuing to believe earnings, particularly in the New Zealand business, will face headwinds in FY18 should iron ore prices decline as expected. The broker upgrades FY17 net profit forecast by 25% and retains a Hold rating because of downside risk in FY18 and valuation. FNArena's database shows five Buy ratings and two Hold. The consensus target is $11.97, suggesting 9.7% upside to the last share price. This compares with $10.37 ahead of the update. Well what is 2017 going to have in store for us in regard to Iron Ore prices? Market analysts are continuing to try and jaw bone the base metal lower, yet price is continuing to simply hold its ground, and the immediate uptrend for that matter. Interesting to note is yesterdays announcement that Western Australia is about to get a new $5.6 billion Iron ore project in the Pilbara involving the billionaire Todd family from New Zealand. It will mean over 3000 new jobs being created and a new railway link built into the central Pilbara region. This comes on the back of RIO Tinto announcing it would cut 500 jobs from its Iron Ore operations basis their view that prices are going to significantly struggle from this year on as a minimum. Certainly very interesting developments unfolding in this market space in 2017 and beyond. Price action is at a clear cut inflection point. In its present form it is hesitating right at equality around the 80.00 price zone, and until it can start pushing beyond here, then the move off the significant 37.00 lows from back in late 2015 can only be defined as corrective in nature. We need equity surpassed and by a reasonable margin before we start turning bullish. The key number we keep talking about is 86.70 which is where overhead resistance resides, yet there is also another significant number that will confirm that the bulls are back in control, and that comes in at psychological 100.00. This is where price finally breaks out from the longer term bearish lowering channel that has kept it in a downward trajectory for the past 6 years. So any move above 100.00 will certainly be a bullish statement. Levels are well overbought on the weeklies right here, yet bullish markets can sustain themselves for long periods of time whilst in this position. The big question is whether Iron Ore is now a bullish proposition or not. Technically, the jury is still out, be it our bias remains to the upside! Using this chart, we will continue to track ASX Iron Ore related stocks that we all like to trade such as FMG, RIO and BHP. FMG has been the absolute star performer over the past 12 month having risen around 350%. Not bad work if you can get it! The stock is up another 5% just within today's trading with the trend well and truly running to the upside. During the same period BHP is up around 80% with RIO also putting in a similar performance. 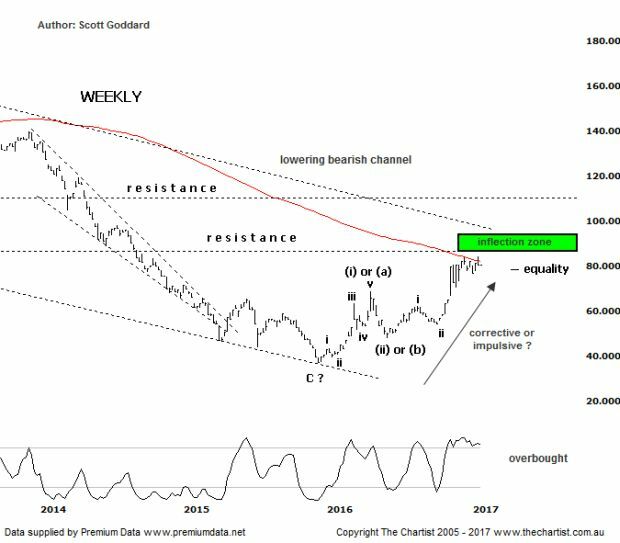 As mentioned in our review, Iron Ore is now at an important potential inflection point, with 86.70 being kept a very close eye on over the coming months as it will dictate whether this trend is going to continue to solidify to the upside, or take a prolonged breather. The former is what we are looking for, which will keep ASX Iron Ore related stocks well and truly on the bid. Re-published with permission of the publisher. www.thechartist.com.au All copyright remains with the publisher. The above views expressed are not by association FNArena's (see our disclaimer). THE RISK OF LOSS IN TRADING SECURITIES AND LEVERAGED INSTRUMENTS I.E. DERIVATIVES, SUCH AS FUTURES, OPTIONS AND CONTRACTS FOR DIFFERENCE CAN BE SUBSTANTIAL. YOU SHOULD THEREFORE CAREFULLY CONSIDER YOUR OBJECTIVES, FINANCIAL SITUATION, NEEDS AND ANY OTHER RELEVANT PERSONAL CIRCUMSTANCES TO DETERMINE WHETHER SUCH TRADING IS SUITABLE FOR YOU. THE HIGH DEGREE OF LEVERAGE THAT IS OFTEN OBTAINABLE IN FUTURES, OPTIONS AND CONTRACTS FOR DIFFERENCE TRADING CAN WORK AGAINST YOU AS WELL AS FOR YOU. THE USE OF LEVERAGE CAN LEAD TO LARGE LOSSES AS WELL AS GAINS. THIS BRIEF STATEMENT CANNOT DISCLOSE ALL OF THE RISKS AND OTHER SIGNIFICANT ASPECTS OF SECURITIES AND DERIVATIVES MARKETS. THEREFORE, YOU SHOULD CONSULT YOUR FINANCIAL ADVISOR OR ACCOUNTANT TO DETERMINE WHETHER TRADING IN SECURITES AND DERIVATIVES PRODUCTS IS APPROPRIATE FOR YOU IN LIGHT OF YOUR FINANCIAL CIRCUMSTANCES. Technical limitations If you are reading this story through a third party distribution channel and you cannot see charts included, we apologise, but technical limitations are to blame. A glance through the latest expert views and predictions about commodities. Iron ore optimism; oil market re-balancing; and a rally in tin. Optimism in China's steel industry is the main driver of iron ore prices over the short term but the domestic iron ore industry could also have an impact on prices, keeping these around current levels in 2017, ANZ analysts contend. Iron ore is expected to be affected by the country's policy on industrial over-capacity. China's State Council announced last year it would reduce steel production capacity by 150m tonnes by 2020. China is also intent on eradicating illegal steel making capacity as it battles pollution and emissions in its major cities. Hence, tightness in the steel market should support iron ore prices and the analysts expect underlying Chinese steel demand to remain robust in 2017. Steel production growth is expected to contract this year, although be matched by a similar fall in growth the net exports from the major exporters. Growth in exports of iron ore from the Australian producers, Rio Tinto ((RIO)), BHP Billiton ((BHP)) and Fortescue Metals ((FMG)) is expected to fall to its lowest level in five years. Another indicator underscoring this expectation is the forecast from Australia's Bureau of Meteorology for an above-average number of cyclones during the local season, which lasts from November to April. This, the analysts suspect, could impact exports by as much as 15% quarter on quarter. Still, the main potential game changer for iron ore is the Chinese domestic industry. Since iron ore price highs of US$180/t were encountered in 2009-14 Chinese output has fallen by more than 60%, as the high cost producers shut down when the price fell below US$100/t. As iron ore prices have pushed above US$80/t in recent weeks, the analysts observe this raises the possibility of a recovery in Chinese iron ore production. If supply pushes up to when prices were last at this level, another 50mt of iron ore capacity could potentially be reactivated in China, in turn sending prices back below US$60/t. Yet, the analysts believe the probability of this occurring is relatively low, as exporters have established strong relationships with buyers in China and now provide nearly 90% of the country's total iron ore consumption. UBS has reduced its long-term oil price assumption to US$70/bbl from US$75/bbl. This reflects a view regarding the cost of developing a marginal barrel outside of the US, although the ultimate range could vary from US$60-80/bbl. Assuming reasonable compliance with OPEC output cuts, the physical oil market appears under-supplied for the second quarter of 2017. The speed of a US response to the OPEC production cuts suggests significant tightening is most likely a 2018 event. The main uncertainties, the broker envisages, revolve around US shale and its capacity to ramp up quickly and be the marginal producer as conventional supplies decline globally. Other variables include the return of Nigerian supply and whether annual demand continues to grow at over 1mmbbl/d. The reduction in long-term oil prices has reduced the broker's forecasts for earnings per share for the oil stocks. The broker expects oil companies to be conservative regarding organic investment in 2017 and mergers and acquisitions are again likely to feature. UBS retains a preference for Woodside Petroleum (( WPL)) with its modest gearing and low-cost LNG production as well as Origin Energy ((ORG)), with its ramp-up of APLNG and and rising electricity prices. The broker has reduced its rating on Santos ((STO)) to Neutral after the recent equity raising and and downgraded Horizon Oil ((HZN)) to Neutral after a 35% rally in the share price. Shaw and Partners also expects the market to rebalance if OPEC delivers on its supply cuts. The trends are already under way with non-OPEC supply falling and demand remaining robust. If OPEC delivers then this should underpin an oil price recovery in 2017. The analysts note inventory levels are still near historical highs and, without OPEC cuts, it would take around two years for the oil market to rebalance. With oversupply, the value of marginal production is zero, and there is no reason to spot prices to rally. The analysts believe, for the current rally to continue, observable down-trends in production and inventory data are needed. OPEC and non-OPEC cuts, if delivered, should eliminate up to 1.8m bpd of supply and result in deficits through 2017. The analyst expect this would result in meaningful reductions in inventories throughout the year, for the first time in four years. Assuming demand remains robust the market should "normalise" by the end of the year, Shaw and Partners estimates. The lowest volume metal of the base metals traded on the London Metal Exchange, tin, was second only to zinc in terms of its recovery in 2016, rallying 45% to trade at US$21,000/t by the end of the year, Macquarie notes. Refined stocks of the metal in warehouses are at low levels, although producer inventories have lifted and mine supply appears to be improving, notably in Indonesia. Key reasons behind the recovery in the tin price include low visible levels of stock on exchanges and reduced export volumes from key producer Indonesia, as well as lower production in China and Myanmar. The broker estimates Indonesian mine production was down 13% in 2016 after price-related mine closures at the start of the year. While Indonesian production looks to be improving, Macquarie suspects Myanmar production growth is slowing. Meanwhile, Chinese metal output was affected from July by environmental shut-downs and data up to October implies there has been no real recovery. The supply developments are not that dynamic and the broker concludes the 2016 rally was mostly driven by one factor that did change dramatically, demand. There was a surge in end-use semiconductor shipments in the second half of 2016 while tinplate production was boosted by stronger-than-anticipated demand from the Chinese steel sector. Together these two features account for around two thirds of global demand. Moreover, Macquarie's semiconductor analysts are projecting global sales growth of 9% in 2017 on a continued recovery in the sector, particularly with wafer fabrication capacity being added aggressively. The broker upgrades its outlook for demand, which should push tin into a deeper deficit over the next few years. Accordingly, price forecasts are raised on average by 5-21% out to the end of the decade. Oil outlook; copper demand; coking coal contracts; steel pricing. Oil prices are expected to recover in coming years, and signs of accelerating cost deflation in offshore and further productivity gains in US onshore compress Citi's oil cost curve. The broker calculates that the incentive price to meet future demand has reduced to US$55-65/bbl, down from US$70/bbl. Hence, long-term oil price forecasts are reduced to US$65/bbl. Citi does not believe the sector is cheap any more. While Santos ((STO)), AWE ((AWE)) and Sino Oil & Gas ((SEH)) remain Buy rated, the broker downgrades Woodside Petroleum ((WPL)) and Senex Energy ((SXY)) to Neutral. Beach Energy ((BPT)) and Origin Energy ((ORG)) are downgraded to Sell. The agreement reached among non-OPEC producers was more favourable than Macquarie expected. Cuts of a total of 582,000 barrels per day have been agreed, spread across 12 countries. After a near 25% increase in the spot West Texas Intermediate price since the recent low of US$43.32/bbl recently, the broker believes the majority of positive news is priced into both spot and forward prices. Macquarie is not inclined to initiate any net short position until spot prices reach US$60/bbl, although acknowledges the risk/reward proposition of being long falls away above US$55/bbl. Negative news is expected to be limited until both execution and compliance with the new cuts are visible in January 2017 and the second quarter of 2017 respectively.
. Nevertheless, the broker's modelling indicates the US shale response will be massive. Macquarie estimates exit-rate production growth of 300,000bpd at the current rig count, 600,000bpd at US$55/bbl and 1.1m bpd at $60/bbl. The outlook for copper demand has transformed this year and Citi believes a favourable trend will hold up even over the long term. The three channels offering sizeable growth potential for copper are urbanisation, electrification and transport over the next 10-15 years. Greater disposable income in China and India is likely to spur demand for consumer goods that tend to be copper intensive. Growing awareness and investment in non-fossil fuel power generation is expected to define the pace at which copper demand benefits from increased utility in this sector. Asia remains at the forefront of copper demand, and the broker estimates consumption is likely to stabilise at around 16m tonnes per annum with further potential to improve over the next 10 years. Reports indicate the March quarter hard coking coal contract between Glencore and Nippon Steel has settled at US$285/t, which is US$100/t higher than Macquarie forecast. This comes despite spot prices falling to US$270/t from over US$300/t in just over a week. The broker incorporates the contract price into its estimates for BHP Billiton ((BHP)) and South 32 ((S32)) which results in material upgrades to earnings forecasts for FY17 of 10% and 12% respectively. The settlement price is the highest since the December quarter of 2011. Macquarie understands that the appetite of Japanese mills to push a hard bargain was lessened because increased more materials prices can be used as leverage with their steel customers. Macquarie expects spot coking coal prices to fall further as the Chinese government has announced production-loosening measures and disruptions at key seaborne suppliers are being resolved. Morgan Stanley has turned bullish on the outlook for coking coal, revising its 2017 price forecast up by 58%. Forecasts are also revised up 36% for thermal coal, 16% for iron ore, 13% for copper and 10% for aluminium. BHP and Rio Tinto ((RIO)) are both set to benefit and the broker retains an Overweight rating on the two, preferring BHP. The positive industry view combines better-than-anticipated prices and ongoing productivity gains, which should deliver better-than-expected cash flow, debt reduction and potential returns. A general expectation that commodity prices will move lower means most miners are reluctant to add supply capacity, and the broker suspects that this, in turn, may mean prices hold at better-than-expected levels for longer than expected. Ultimately, if there is enough incentive there will be a supply response but until then the likes of BHP and RIO should generate strong margins. The broker notes large miners typically outperform during a reflationary period and rotation in the industry. The metrics look compelling if even half the spot price upside is captured, the broker asserts. Ord Minnett also believes the outlook is bullish for the miners. The gap between 2017 spot earnings and consensus forecast remains large, suggesting the consensus upgrade cycle should continue in the near term. Meanwhile, balance sheets are in good shape across the sector which means reporting season should witness a return of higher dividends and/or capital management. Also, Chinese economic data remain supportive of commodity demand and buoyant prices. In considering these factors many investors that are underweight the sector are expected to neutralise this position heading into January/February, and this is another re-rating catalyst. Morgan Stanley believes supply-side reforms in China will create more favourable pricing for steel worldwide. The broker is more confident that China can achieve its permanent capacity reductions of 150mt by 2020. The merger between Baosteel and Wuhan Iron & Steel also shows that the industry continues to consolidate, pointing to improved fundamentals over the next 3-5 years. Morgan Stanley believes China's steel exports will stay in a range of 100-120mt over the next few years. While this will improve the fundamentals of the global steel industry overall, the broker expects steel stocks in China, Australia, Latin America, India, Japan and North America will outperform as the benefits of supply-side reforms are not fully priced in. Coking coal uncertainty; few bearish catalysts for oil; iron ore softens; Ord Minnett raises copper forecasts, lowers gold; tight primary supply of lead. -Is OPEC underestimating the cost curve for new US shale? Price negotiations for metallurgical (coking) coal in the first quarter of 2017 are soon to begin. Morgan Stanley observes corresponding spot prices are falling from a great height, while the state of China's local mines remains a market mystery. The broker does not believe conditions have normalised. While the quieter northern winter trade has begun, seaborne spot prices are likely to remain elevated into 2017, mainly because of the lack of clarity over the ongoing reform program in China. Morgan Stanley believes a review of China's altered import flows is now needed to re-set the price outlook, given what is known about the scale/duration of the reform program. A reasonable estimate of the potential upside risk to the market's 12-month price outlook for key coking coal products would be at least 30%, in the broker's calculations. The broker also notes the return from bankruptcy of US-based coking coal plays, Alpha Natural and Arch Coal, highlights the extraordinarily tight conditions prevalent in global coal trades. There are few bearish catalysts for oil in the near term, Morgan Stanley contends. Other than a complete collapse of the deal gained at the recent OPEC meeting, the broker does not envisage many catalysts that will reverse the recent rally. Evidence of falling OPEC production in January could add to bullish price action. Scepticism regarding compliance is warranted, in the broker's opinion, but any evidence to support this is unlikely to emerge before March or April next year. Nevertheless, OPEC appears unconcerned about a US supply response and Morgan Stanley suspects the organisation may be underestimating the cost curve for new shale, and the size of the response if both OPEC and its non-OPEC allies cut production. Morgan Stanley notes positive onshore trends in the US started to emerge even before the OPEC agreement and resultant price surge. Given the amount of hedging and rig activity, US production may surprise both in magnitude and its timing. Buoyant iron ore prices are currently based on a combination of coking coal strength, resilient Chinese demand and broader risk appetite, Ord Minnett observes. As 2017 progresses the broker expects prices to soften from current levels, as the market digests a slight oversupply and coal prices ease as marginal production responds. The broker's revised forecasts envisage around 58mt of oversupply in 2018, before the market starts to look more balanced. Ord Minnett upgrades price forecasts to US$60/t and maintains 2017 Chinese steel production growth assumptions. At the same time, the broker expects the major miners to add 77mt to the market. 2018 appears to have the weakest pricing fundamentals, in the broker's opinion and the long-term price forecast of US$50/t is unchanged. Ord Minnett increases its price forecasts for coking coal and copper, while downgrading near-term forecasts for gold. The broker believes the mining sector can continue to re-rate based on the significant value that exists, with around half the broker's coverage trading at net present value or lower. Significant cash is being generated at base-case prices and balance sheets are also in good shape. Ord Minnett raises 2017 copper price forecasts by 7%, although still expects copper to decline to US$2.03/lb in 2018 from the spot price of around US$2.60/lb. Coking coal forecasts for 2017 and 2018 are raised 30% to US$175/t and 7% to US$125/t, respectively. Gold price forecasts are reduced by 9% to US$1225/oz for 2017 and to US$1291/oz for 2018. Ord Minnett upgrades Alumina Ltd ((AWC)) to Accumulate from Hold. Spot alumina continues to look strong at US$325/t and presents upside potential to the broker's earnings estimates. The broker also upgrades Whitehaven Coal ((WHC)) to Accumulate from Hold, recognising it may be late with its call but is factoring in higher coal price forecasts and the company becoming net cash within the year. Among major miners, the broker continues to prefer Rio Tinto ((RIO)), based on more attractive valuation metrics and a higher chance of capital management. Fortescue Metals ((FMG)) remains a key pick as its strong free cash flow yield will start to migrate to a dividend yield as the company hits its US$3m net debt target in the next year. Newcrest Mining ((NCM)) is the broker's least preferred gold stock for its stretched valuation and likely gold sector de-rating. For those seeking gold exposure, Ord Minnett recommends Regis Resources ((RRL)). Lead prices rallied sharply in the past week, hitting an intra-day, five-year peak of US$2576.50/t before a dramatic sell-off the following day. Macquarie believes the usual suspects, Chinese investors, scooped up the relatively unfashionable metal before selling it off again. The reason is probably because lead was looking left behind by the rest of the complex. The metal was becoming highly discounted to its sister metal zinc and, while zinc was also moving up, the subsequent rally has reduced lead's discount to well below US$400/t. Speculative momentum aside, Macquarie notes the fundamental lead market does look a little tighter. Primary supply is tight and lead mine output has been hit by the same reductions as in zinc, although has also been experiencing a contraction in Chinese domestic output because of intensifying environmental scrutiny at the country's mines. Traceable mine output data signals a drop of 11% in the first nine months of the year versus the same period over 2015. In the scrap market, which contributes around 51% to overall supply, battery stocks were drawn down in October, as high lead prices drew out material. The broker observes the market is somewhat lean. Nevertheless, with this side of the market well covered, buyers have felt no pressure to accept the rally in lead prices, and scrap prices have failed to keep pace. Macquarie observes demand, which is dominated by lead acid batteries, has been supported by much stronger automobile sales and production across several regions over the year. The broker envisages a better outlook for demand. Still, while lead prices deserve to lift somewhat, the recent rally is considered to be well in excess of the fundamentals. Macquarie expects prices will retrace back to more justifiable levels in the low US$2000/t range, with the potential for further slippage after the peak battery demand in the northern winter period. On the other hand, a sharp fall in winter temperatures would facilitate more battery failures and may create a squeeze in the scrap market, in turn causing buyers to accept some of the higher prices. Outlook for metals; iron ore outlook becoming more constructive; steel demand; the upcoming OPEC meeting. Goldman Sachs notes that historically, when the US and Chinese output gap closes and inflation begins to rise, this is a buy signal for commodities. Supply restrictions from policy actions should benefit oil, coking (metallurgical) coal and nickel in the near term, while economic reductions should boost natural gas and zinc. The analysts downgrade three and six-month gold price forecasts to US$1200/oz on a stronger cyclical outlook. Morgan Stanley notes the shock of the US election is now passing and commodity prices are normalising, largely via currency adjustments. The broker suspects the proposal to rebuild US infrastructure is probably bullish for metal trades given the size of the US economy. The US economy currently consumes up to 20% of the world's metal ore supply and was the biggest buyer before China became fully engaged in global trade a decade ago. The US remains heavily dependent on oil, lead and coal. Nevertheless, Morgan Stanley highlights that any lift in demand growth these particular commodities can probably be met by domestic supply. The broker calculates that a reasonable boost for the US economy would be one where consumption rates lift back to historical highs, which would represent a 2-5% lift in global demand for copper, aluminium, alumina, zinc and lead but little change to nickel. ANZ's analysts believe a sustained downturn in the iron ore prices looks increasingly unlikely. A combination of seasonally strong steel demand in China and risks for further supplier disruptions could mean the market enters a period of tightness. Supply-side issues are seen having a greater potential impact on the market. Growth in exports from Australia have been slowing for some time but there are signs the slowdown will accelerate in coming months. Rio Tinto ((RIO)) recently announced it would shut its Hope Downs mine for two weeks in December to reduce operating costs and maximise cash. While a shut-down of this nature will only have a small impact, the analysts note this appears to signal a shift from the strategy of expansion at all costs. Meanwhile, the potential for further disruptions over the southern hemisphere summer is also higher. The Australian Bureau of Meteorology is forecasting an above average number of cyclones in 2016/17 and the Pilbara coastline has a 63% chance of more tropical cyclones than average. Goldman Sachs is also more constructive on the iron ore outlook in 2017. Demand has surprised to the upside in China after the credit stimulus earlier this year. Supply, on the other hand, was slow to increase because of delayed capital expenditure and operational challenges. Besides the fundamentals, a rally in metallurgical coal prices and a weaker Chinese currency, as well as the risk-on sentiment after the US election, have also supported iron ore prices. Goldman Sachs upgrades its iron ore price forecasts for the next three months to US$65/t, six months to US$63/t and 12 months to US$55/t. From 2018 and beyond, the broker revises up its long-term equilibrium price forecasts to US$45/t from US$35/t. The broker expects Chinese steel demand will weaken in 2018 and the iron ore inventory re-stocking process run into physical constraints. Political uncertainties at the macro level and elevated levels of port inventory at the micro level suggests significant risks to the broker's forecasts, and the high level of volatility seen in the market this year is expected to continue. Macquarie's latest steel survey from China shows a broader based improvement in demand and sentiment. Domestic orders improved over the past month for Chinese steel mills and, while property and infrastructure demand for steel has eased, a clear improvement has been witnessed in the machinery and automotive sectors. The analysts note steel mills continue to re-stock raw materials and coking coal inventory is falling on tight supply, while iron ore stocks are flat month on month. Despite the rise in raw material costs, such as iron ore and coking coal, steel mills report they are in positive margin territory and are maintaining stable capacity utilisation rates. Goldman Sachs also notes steel consumption is more resilient than previously expected and demand for iron ore is likely to be supported by further incremental re-stocking across the steel supply chain. ANZ analysts expect OPEC (Organisation of Petroleum Exporting Countries) will reach an agreement at next week's meeting in Vienna and observe money managers have been aggressively shorting oil as OPEC members have increased their output. This suggests the market remains unconvinced that the cartel will reach an agreement. Yet the analysts note comments from various OPEC members signal an agreement is possible. Iran's oil minister has said it was highly probable that members would reach a consensus. OPEC production is near a record high, driven by strong output from Saudi Arabia and smaller members. Nevertheless, the analysts point out that any agreement must take into account Iran's production remains below its peak achieved nearly 10 years ago. Prices have been trading in a tight range over the past six months, and strong support appears established around US$43-44/bbl. With positioning already so short, even if OPEC fails to reach agreement the analysts expect selling to be relatively limited. Instead, the risks are seen firmly skewed to the upside in the short term, with agreement on production cuts likely to mean prices test the highs seen in 2016, at around US$53/bbl for Brent. The analysts estimate the market will move into a deficit in the first quarter of 2017, assuming OPEC cuts production by 750,000 b/d in the first half. Without production cuts the deficit would likely be delayed until the September quarter. This is because most members are pushing towards capacity and this should mean limited increases in output in 2017. Stronger-than-expected demand growth and lower production from high-cost countries increases Goldman Sachs' confidence that the global oil market will shift into deficit by the second half of 2017, even with OPEC production at current levels. Thus, there is now stronger incentive for OPEC producers to halt inventory growth in the first half and normalise the current high level of inventories with a short duration cut to production, in the broker's view. Goldman Sachs believes a cut to production would help OPEC grow market share by sidelining higher-cost producers and reducing oil price volatility, which would increase the valuation of members' debt and equity. The Dow closed up 59 points or 0.3% while the S&P gained 0.1% to 2204 and the Nasdaq fell 0.1%. The SPI Overnight was suggesting only a 7 point gain before the opening bell on the local market yesterday – a fair call despite more records on Wall Street given the ASX200 had rallied 60-odd points the day before. Iron ore had jumped 6% that night but iron ore futures had already rallied during Tuesday so the market was on to it. But we closed up another 71 points. The chartists had suggested a breach of 5400 would pave the way for a move to 5500 and there seemed some level of self-fulfilment yesterday. As was the case on Tuesday, the local market did not step-jump up yesterday, it started from zero and tracked a straight line up to the close, without as much as a stumble. Momentum was at work. It seems as if the local market has been in a daze this past couple of weeks as it tries to come to terms with a Trump presidency. There have been many reports in the media warning of just how bad Trump could prove for Australia. But as each passing day indicates Trump’s policy pledges were all about winning the election and not about how he would actually run the country, those initial fears have begun to be tempered. If it didn’t happen on Tuesday, it happened yesterday – investors suddenly saw Wall Street breaking records and decided Australia was missing the boat. Get in and buy! Only the healthcare sector missed out on an otherwise market-wide rally yesterday, thanks to the ongoing fallout from Fisher & Paykal Healthcare’s ((FPH)) earnings result. That stock was down 7% and the healthcare sector closed flat. Otherwise, it was green-on-screen. The resource sectors were again in the frame – materials up 2.0% and energy up 1.3% -- but the fact industrials were up 2.2%, telcos 2.1% and utilities 1.4% indicated investors were moving back into the likes of bond proxy stocks and previous high-PE names that had been trounced over the past month or more. The banks also made their contribution with a 1.1% gain. Did anyone notice yesterday’s major data release? It seems not. Construction work done fell 4.9% in the September quarter to be down 11.1% year on year. It was a much softer result than economists were expecting. Private sector work fell 6.6% to be down 36%. The bulk of that fall reflects the ongoing wind-down of resource sector construction. Engineering fell 3.8% to be down 23.2%. Last year it was all about building work, particularly residential, striking the balance. Building work in general fell 5.7% to now be only 1.4% higher year on year. Within that, residential fell 3.1%. The decline in resource sector construction will soon reach its nadir, but now we see the beginning of the cooling of the housing market. The Australian economy needs a new hero. Within those companies most impacted over the last few years by the mining downturn – engineers & contractors – a scramble has been on to diversify into public infrastructure and away from the mining and oil & gas sectors in order to re-establish themselves. In the September quarter, public construction rose by only 1.4% but it is 15.7% higher year on year. Economists estimate the overall construction number for the quarter will shave 0.4 percentage points off GDP. As housing cools, public sector spending will need to take the baton. The healthcare sector was also a drag on Wall Street last night. Test results showed that Eli Lilly’s prospective Alzheimer’s drug failed to deliver. That stock fell 10% and weighed generally on biotechs, sending the Nasdaq down 0.1% following two record-breaking sessions. It looked for most of the session that the S&P500 would also ease back after its record thirteen-day winning streak, but the broad market index just managed to fall over the line at the death. The Dow, on the other hand, powered on. The Trump theme continues to underscore for many of the big caps in the Dow Industrials and very much so in the Dow Transports. But there was more to be positive about last night. Deer & Co shares jumped 11% following that company’s earnings report. Deere is not a Dow stock but peer Caterpillar is. The banks continued on their merry way last night and because of the peculiarities of the arcane price-average, recent addition Goldman Sachs is very influential because it is a US$200-plus per share stock. US durable goods orders surged 4.8% in October when 3.3% was expected. It mostly came down to lumpy aircraft orders, but ex-transport the result was still a 1% gain. The minutes of the November Fed meeting were released last night but no one paid any attention, given they are pre-Trump. The indications are nevertheless a rate rise next month is baked in, but everyone knows that. There would have been no surprise had Wall Street eased off last night as traders squared up ahead of what is effectively a four-day holiday. But that was not the case. We’ll need to see what happens next week after everyone’s had a rest. Iron ore is up another US$1.10 at US$74.90/t. At what point will the Chinese government step in with more dramatic measures to curb speculation? And not just in the bulks, but in base metals too. Aluminium and lead rose another 1% last night, copper and nickel 2% and zinc 3%. These moves came, yet again, despite a stronger greenback. After one little dip, the US dollar index is back up 0.6% at 101.64. Alas, the death knell sounded for gold. It fell US$24.60 to US$1187.10/oz, accelerating once the 1200 mark was breached. The oils were little moved last night. The Aussie is down 0.2% at US$0.7386. On a combination of US dollar strength and the weakness in yesterday’s Australian data, we might expect a bigger drop. But look at those commodity prices. The SPI Overnight closed down one point. There’s no holiday in Australia tomorrow, but with Wall Street closed, it may be a case of looking to square up a bit downunder, particularly after a 130 point rally over two sessions. Today brings September quarter capital expenditure numbers. It is also a very big day on the AGM calendar, with highlights including South32 ((S32)) and Woolworths ((WOW)). All paying members at FNArena are being reminded they can set an email alert specifically for The Overnight Report. Go to Portfolio and Alerts in the Cockpit and tick the box in front of The Overnight Report. You will receive an email alert every time a new Overnight Report has been published on the website.